Subscription box services seem to be all the rage. Bonding Bees is a company of that nature, geared towards couples. Bonding Bees is a refreshing way to experience new things with your partner, and also make sure to put aside some time to enjoy each other’s company while staying in. Every box is a surprise, so you can both look forward to what’s getting delivered to your front door each month. Activities include couples trivia games, painting activities, cocktail recipes, and more! There are three levels of subscriptions: Curious (month to month), Crushing (3 months), and Committed (6 months). In an effort to give back, each box helps a child in Brazil who is currently living in poverty. Additionally, a ‘Couple of the Month’ is randomly selected and Bonding Bees will make a donation to a charity of their choice. Learn more, challenge each other and rekindle the spark from the comfort of your own home. The Bonding Bees motto is "Gather. Give. Grow." In a nutshell, the company encourages you to gather for one night each month and take the time to focus on each other, spending real quality time bonding. They want you to give to your partner by investing time in the date nights. Plus, Bonding Bees gives to children in poverty for each box sold. The customized date nights are curated to help couples grow. I really liked the appearance of packaging from Bonding Bees. All items arrived neatly placed in a pink box with the company's logo. Inside, the date night items were wrapped with tissue paper. Ciao Bella booklet with instructions on how to use each product, fun facts about Italy, and a list of romantic Italian phrases. Stuff to make a small pizza - pizza crust mix, pizza sauce, Parmesan cheese packets, seasonings packets, pizza cutter, oven mitt. Things to make a canvas masterpiece - two small canvasses, two paintbrushes, box of six colored Acrylic paints. Italian playing cards - deck of cards to play Scopa, an Italian game. Of all subscription boxes I've purchased or received for review, I have to say that Bonding Bees is probably my favorite so far. The items inside the box were things that me and Jason could enjoy doing together. The instruction booklet was very informative. We weren't just left to our own devices. The Italian game, Scopa, was a new and entertaining game. Cooking the pizza together provided quality time. Painting the canvasses was my favorite part. 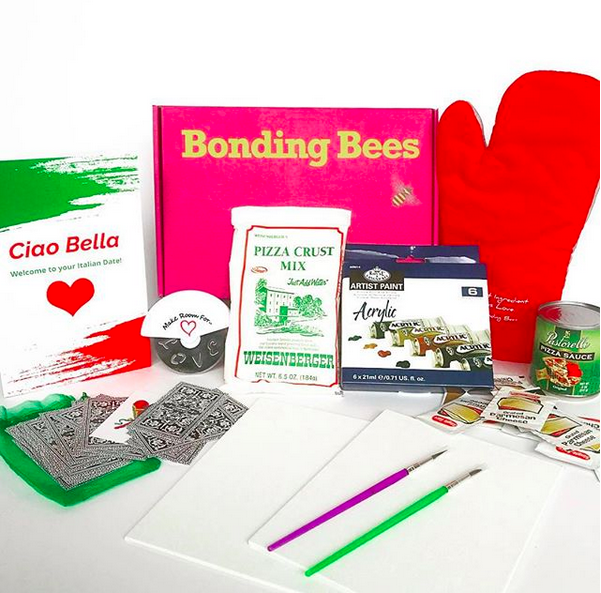 I was very pleased with the products chosen for the Bonding Bees subscription box. The items included in the box were of good quality. I didn't feel like I was getting cheated. Jason and I spent a whole day bonding, and that's exactly the purpose of Bonding Bees. Jason's masterpiece is on the left and mine is on the right. I love subscription boxes. This looks like a fun one for sure! I haven’t heard of this, but it’s definitely something I plan on getting and will tell family and friends about it. This is awesome!! What a great idea!